Alfresco gas pizza ovens are one of the most versatile pizza ovens in the world, giving you the ability to bake, roast, sear, and of course cook restaurant-quality pizzas super-fast. Made of 304 stainless steel, the Alfresco outdoor pizza ovens are available in built-in, countertop, and freestanding configurations, for natural gas or propane. Alfresco pizza ovens are very efficient – they heat up in just 16 minutes and cook a pizza in as little as 4 minutes. The infrared rear burner heating system adds 40,000 BTUs of cooking power. The infrared hearth burner heats the gas logs that retain heat, allowing your food to cook faster than you would have thought possible. You can easily cook a 14-inch family-size pizza within the 456 square inches of cooking space and the halogen oven light makes it easy to see your food at night. 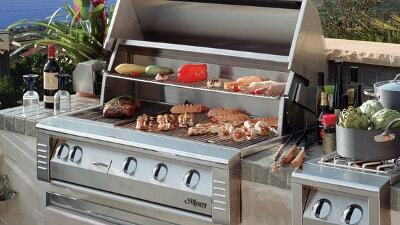 The included stainless steel wood and herb box gives your food a great wood smoked flavor. You can also add water to the wood and herb box to produce steam while baking. The cart is perfect for moving your pizza oven around your outdoor kitchen. If you choose the freestanding on-cart option the unit has adjustable legs and is designed to sit on the 30-inch pizza oven cart. The cart has caster wheels and a handle, making it quick and easy to move around your outdoor kitchen with ease. Don’t forget your pizza accessories! Check out PizzaCraft for some fun products to accompany your new pizza oven. You can find a rocking pizza cutter, calzone press, pizza peel, pizza server, pizza serving stand, pizza dough scraper, rolling pins, and more!